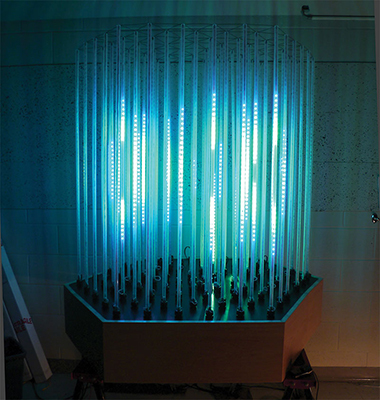 ICECUBE LED Display [ILDm^3] is a cubic-meter (1/1000th scale) model of the IceCube Neutrino Observatory. This novel telescope looks for nearly invisible cosmic messengers, neutrinos, using a cubic-kilometer of instrumented ice starting 1450 meters below the surface at the South Pole. 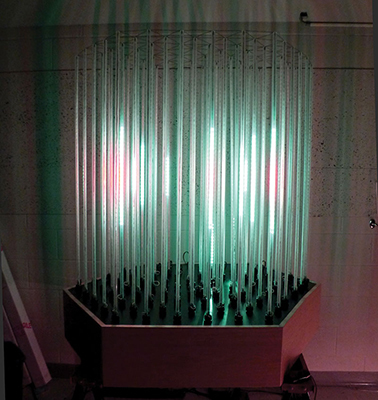 ILDm^3 sits low to the ground on a base of wood that supports 86 acrylic rods, each with 60 vertically arranged full-colour LED’s (5,160 total). 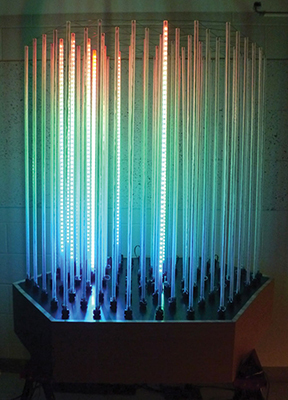 Each LED is a representation of a sensor, a.k.a. Digital Optical Module (DOM), in the South Pole array. A small interactive interface is used to control the work. Spatial sonification (sound mapping) of the data enhances the representation of events on the model, allowing observers to audio-locate events, as well as see them. This is a second, smaller version of an eight cubic meter (1/500th scale) display we developed previously. Through these projects we attempt to create a high quality experience of the information being presented with the goal of knowledge dissemination and the ability to convey an intuitive understanding and the experience of data. 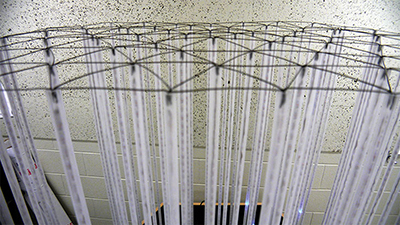 The models represent an epistemological nexus between art and science. 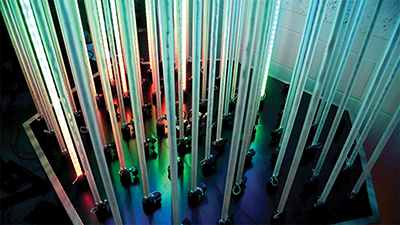 While scientifically precise, the display uses art methodologies as an optimal means for expressing imperceptible astrophysical events as sound, light and colour in the domain of the human sensorium. The result is an experience that is as aesthetically critical as it is facilitatory to an intuitive understanding of sub-atomic astrophysical data, leading to new ways of knowing about our Universe and its processes. The project team involves WIPAC researchers, faculty, staff and undergraduate students from the University of Wisconsin-River Falls, as well as researchers, graduate, and undergraduate students from York University. Student Researchers: Nicholas Abbruzzese, Rohan Likhite, Lex Moakler, Colin Ruan, Andrew Sidsworth, and Ursula Sarracini from Digital Media at York University; and Sanjida Sharmin Mohona from Electrical Engineering and Computer Science at York University.